Liftoff of space shuttle Atlantis on its STS-132 mission, the shuttle's 32nd and final planned mission to space since it began flying in 1985. Launch was on time at 2:20 p.m. EDT. Full Story. CAPE CANAVERAL, Fla. - The space shuttle Atlantis launchedmajestically into space Friday on its final planned orbital trek before NASAretires the reusable space plane and its two sister ships for good. Atlantissoared into clear skies from Launch Pad 39A here at Kennedy Space Center at2:20 p.m. EDT (1820 GMT). Commander Kenneth Ham is leading Atlantis' crew of sixveteran astronauts on a 12-day sojourn to the International Space Station. "On behalf of all the manufacturing, processing, flightand launch teams that have worked on Atlantis since March of 1980, I'd like towish you all good luck, godspeed, and have a little fun up there," shuttlelaunch director Mike Leinbach radioed to the crew shortly before launch. "Thanks Mike," Ham replied. "Those are greatwords, and like you said, there's a thousand folks out there that have takencare of this bird for a long time. Right now a special thanks to orbiter for gettingus off the pad today. And we're going to take her on a 32nd flight, and if youdon't mind, we'll take her out of the barn and make a few more laps around theplanet." After this flight there are only two space shuttle missionsleft before the orbiters are retired and sent to museums around the country.This is Atlantis'32nd journey to space, and the 132nd space shuttle mission since the fleetbegan flying in April 1981. "It truly is an amazing part of our spacehistory," STS-132 mission specialist Stephen Bowen said in a preflightinterview. "It's a shame to be seeing it going away but after 30 yearsit's probably time to move on." On a lark, the finalcrew of Atlantis took a break to pose for a photo in matching tuxedos withbow-ties before suiting up in their orange launch-and-entry suits Fridaymorning. There was some last-minute drama over a tiny ball bearingfound in Atlantis' cargo bay earlier this week. Mission managers wanted to makesure the metal BB wasn't a sign of loose hardware in the shuttle's cargo bay.In the end, it was no concern and Atlantis blasted off as planned. Television host David Letterman, moonwalking astronaut BuzzAldrin, and former NASA administrator Mike Griffin were among the famous guestspresent for the historic launch. More than 39,000 guests were at Kennedy SpaceCenter for the launch, plus more than 150 NASA fans at a "tweetup,"or meeting for NASA Twitter followers. Skywatchers on Earth will have one last chance to seeAtlantis in space with their own eyes during this mission. The shuttlecan be seen before its Sunday docking at the space station and after itsdeparture later this month. Flying with Ham and Bowen are pilot Dominic "Tony"Antonelli and mission specialists Michael Good, Garrett Reisman, and PiersSellers. Atlantis is delivering a new $200 million Russian room ?called the Mini Research Module-1 (MRM-1), or "Rassvet"("Dawn" in Russian) ? to the space station, along with a load ofspare supplies, including a space-to-ground antenna and a set of new batteries.In exchange for transporting the module aboard a space shuttle, the UnitedStates was allowed to stow about 3,000 pounds (1,400 kg) of cargo inside it, includingnew laptops, food and supplies for the crew. The astronauts plan three spacewalks during their dockedmission at the space station to install the new hardware. The crew will be doing "a whole lot of servicing tasks tobasically set up the station ? sort of brand-spanking-new condition for thepost-shuttle period ? changing out some batteries, putting in some newcommunication stuff, basically little upgrades across the station so it's ingood shape for the long haul," Sellers said. Atlantis is scheduled to dock with the orbiting laboratoryon Sunday at 10:27 a.m. EDT (1427 GMT). Today's launch is occurring amidst a transition period for America'sspace program. With the shuttle fleet retiring, NASA and lawmakers must decidehow to move forward. U.S. President Barack Obama has proposed relying oncommercial companies to build spacecraft to take people to low-Earth orbit andthe space station. Meanwhile, NASA would focus on designing a heavy-liftvehicle to carry astronauts to a nearby asteroid and on to Mars. This plan has met with resistance from some lawmakers andformer astronauts, such as NeilArmstrong, first man to walk on the moon, who argued that the plan was toohastily assembled and that private industry is not yet ready to transportastronauts to space. Armstrong's Apollo 11 moon mission crewmate Buzz Aldrinhas spoken out in favor of the new NASA plan. Regardless of how the new era shapes up, the current era inU.S. space exploration is coming to a close. Atlantis flew on her first flight in October 1985. Theshuttle was named after the RV Atlantis, a two-masted sailing ship that servedas a research vessel for the Woods Hole Oceanographic Institute in Woods Hole,Mass. "She started production 30 years ago, so it's been agood long run for Atlantis," NASA test director Mike Leinbach said of thespace shuttle. During her previous 31 missions, Atlantis has played aninstrumental role in helping to build the space station and repair the HubbleSpace Telescope. The shuttle is slated to end its final mission on May 26 witha landing here at the Kennedy Space Center. "The legacy itself is unbelievable," Ham said in apreflight interview. Among Atlantis' accomplishments are delivering the HubbleSpace Telescope, the Magellan and Galileo spacecraft, as well as numerous tripsto the former Russian space station Mir and the International Space Station. "This incredible machine has done so much for humanity," Ham said. SPACE.com is providing complete coverage of Atlantis'STS-132 mission to the International Space Station with Senior Writer ClaraMoskowitz in Cape Canaveral, Fla., and Managing Editor Tariq Malik based in NewYork. 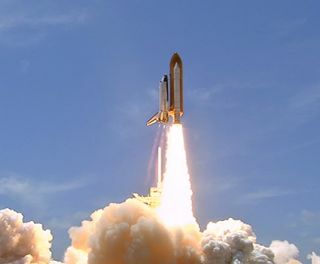 Click herefor shuttle mission updates and a link to NASA TV.